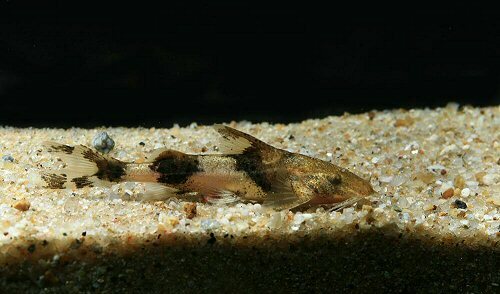 ts the penultimate month of 2017 and we head to Asia for an interesting group of fishes that have captivated many catfish lovers over the years due to their unusual mode of stability in the mountain streams where they are adapted to live by using the adhesive apparatus on the underside to attach themselves to rocks, and prevent them being washed away. Glyptothorax is distinguished from all other sisorid genera by having an adhesive apparatus on the thorax with with grooves parallel or oblique to the longitudinal axis of the body (vs. thoracic adhesive grooves transverse to the longitudinal axis of the body in Pseudecheneis, and thoracic adhesive apparatus absent in all other genera). Glyptothorax lampris is found over course substrates in medium-sized upland rivers of the Mekong and Chao Phrya basins and like other members of this genus, its diet consists of aquatic insect larvae. Caudal peduncle slender, depth about 3 times in its length; body and head covered by rough tubercles of very heterogeneous sizes. Greyish brown body with 3 dark brown saddles (under dorsal, adipose and at the caudal base), connected by a dark mid-lateral stripe, leaving pale oval patches. This is a cool water species of which most of this genera are. A good water flow is also important with high oxygen levels. Other Asian tank mates such as Rasboras, danios, devario's and Puntius species. No reports of sexual differences. Although it is believed that the females are more rotund ventrically than the males when viewed from above. Caudal peduncle: The narrow part of a fish's body to which the caudal or tail fin is attached. Adipose: Fleshy finlike projection without rays, behind the rayed dorsal fin. Glyptothorax: With a carved breast-plate. Froese, R. and D. Pauly. Editors. 2008.FishBase. World Wide Web electronic publication. www.fishbase.org, version (01/2009). Asia: Chao Phraya and Mekong drainages, China, Laos, Thailand and Cambodia. Type locality: Chieng Mai [Chao Phraya drainage], N. Thailand.